And right, a genuine bottle of Stella Beer from someones recent return to the Zone is shown here and also on the lad`s table. 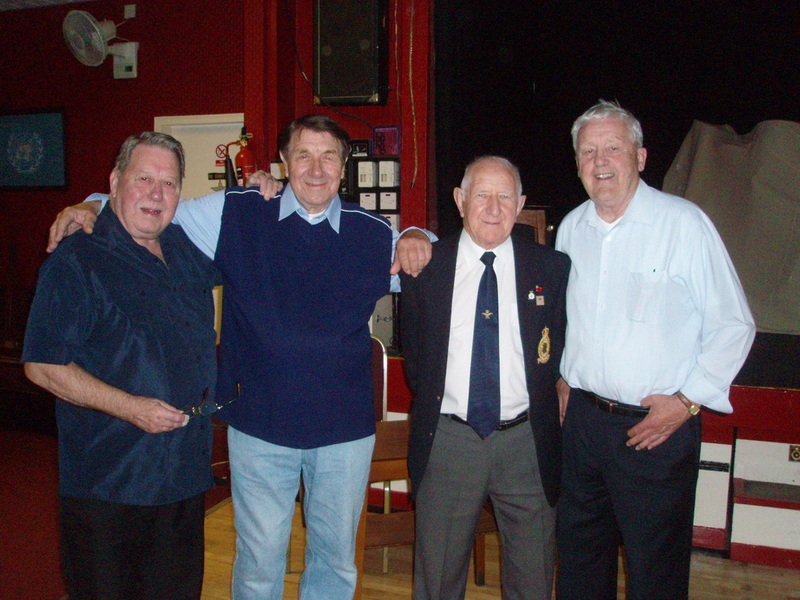 L to R...Jack Garry (Kas), Stan Clarke (REME), Arthur Bach (REME ), John Davies ( Kas ) and Ray ( TEX ) Williams ( Kas ). Stan and Arthur spent some time at Kas working on the equipment and structures for the Parachute Training Section ( see British Pathe Link on My Links Page ). The lady vocalist entertained with songs from the fifties. By Jack`s own definition, " The 3 Kas Stoogies "...with Jack, John Davies and Ray Williams at the Stretford Branch Canal Zoners meeting on Valentines Day Feb 14th 2012. The Stretford Canal Zoners meeting May 2013 with l to r - Geoff Richard (Ismailia 1948+), two ex Army lads, Bill Cosgrove (new member, worked in the Kasfareet power station), Jack Garry,Ray Williams is standing and John Davis SHQ seated.